GOLD, bulls on the run! Based on my gold analysis from the previous days I will present my trade as well today. This is intra-week trade and I will keep at least until the end of this week, maybe more if everything will be acording to the technical prediction. 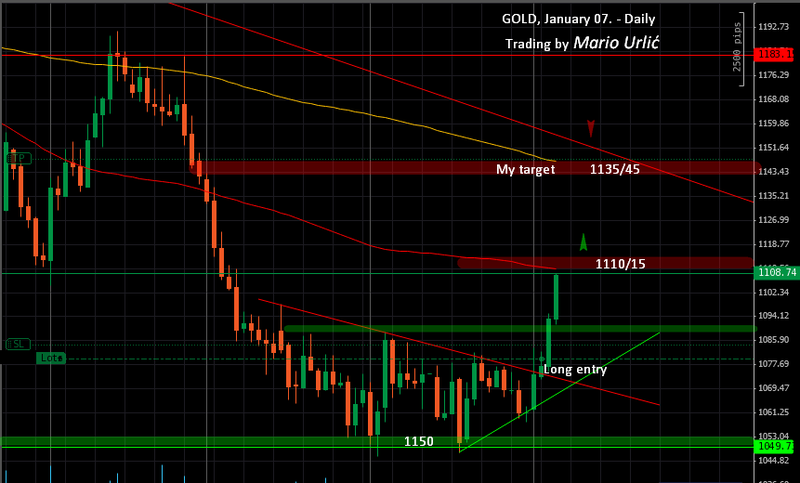 I have opened long position at January 05., after the gold broke this down trend line and here we are two days latter. First resistance at 1185/90 was broken yesterday successfuly and now we have daily MA100 and resistance at 1110/15 in front of us. As I wrote in my yesterday analysis, the bulls should brake this level if they want to go higher toward 1135/45 and daily MA200, where I have placed my TP, 680 pips away from my entry. This trade have RR ratio of 1:10. As I see it, it want be easy to brake true daily MA100 and that’s what I have mention in my analysis from yesterday. Short term traders should consider to hedge, or to close long positions here at 1110/15. The buyers are serious, but the sellers are strong here as well for sure. On the way back, the gold bulls have already defended the support level near 1190 today, let’s see can they handle the sellers on the way up!? Very interesting beggining of the year on gold, love it.